Fish & wildlife specialist Dave Gibson with a muskie caught during past fisheries sampling work. Vermont Fish & Wildlife will be stocking over 5,000 muskellunge fingerlings in the Missisquoi River and Missisqoui Bay in Swanton on Tuesday, Aug. 25, as part of the Department’s ongoing Lake Champlain muskellunge restoration initiative. 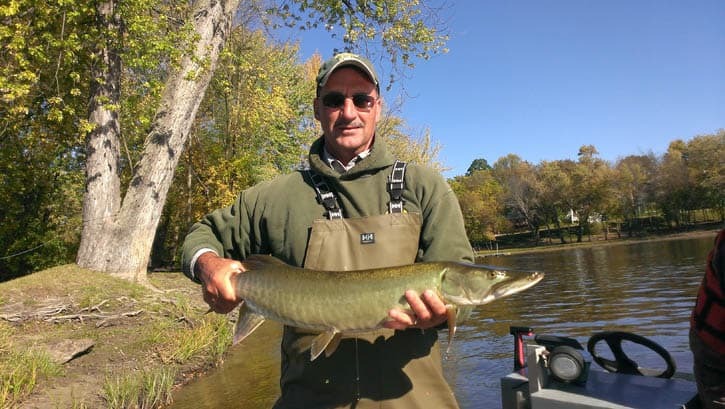 Muskellunge can grow to be one of the largest freshwater gamefish in the country, often exceeding 50 inches in length and 50 pounds in weight. But it’s their aggressiveness that really makes muskie such a desirable sportfish, Good says. Muskie are fabled for their vicious strikes and powerful runs during battle, and the species has a tendency to leap acrobatically out of the water during a fight. Muskellunge are one of four species of esocids (pike family) native to Vermont, along with northern pike, chain pickerel and redfin pickerel. Lake Champlain and its tributaries are the only locations in New England that historically supported natural muskellunge populations. Although the native Lake Champlain muskie population was once widespread, it began to decline in the 1970s, and is thought to have been extirpated completely from the lake following a paper mill spill in the Missisquoi River in the late 1970s. “This week’s stocking effort is another step toward returning this great species to Lake Champlain, and the Missisquoi River,” Good said. Vermont Fish & Wildlife has been conducting annual muskie stocking activities since 2008, and have released over 38,000 muskie into the lake since then. The six-inch long muskie fingerlings, which were be stocked on Tuesday, Aug. 25, at multiple locations throughout the Missisquoi River and Missisquoi Bay, are being provided through a cooperative effort by the New York Department of Environmental Conservation. The fish are raised at NYDEC’s Prendergast Hatchery on Chautauqua Lake in western New York. To learn more about Vermont’s fisheries management programs and fishing in Vermont, visit www.vtfishandwildlife.com.